Congress President Rahul Gandhi on Monday dared Prime Minister Narendra Modi to a debate on the Rafale jet deal with France, reiterating his graft charge against the government.He said that he was ready for a debate with Modi at any place and time to prove that the government will get each Rafael jet for Rs 1,600 crore against the Rs 540 crore when the contract was signed during the earlier UPA rule.Addressing a meeting of party workers, he said that Modi could not look him in the eye when he spoke in Parliament on the aircraft deal. "I spoke before the 'chowkidar' with a 56-inch chest. He was looking everywhere but towards me. A corrupt person when told about his theft can't see you in the eye," Rahul Gandhi said.The Congress President said that during his 1.5-hour reply to the debate, Modi did not speak a single word about the Rafale deal.He reiterated his charge that Defence Minister Nirmala Sitharaman had lied to the nation that the aircraft price can't be revealed as per a pact between India and France.The Congress leader had claimed that the French President had told him that there is no such pact and that the Indian government can reveal the price to anyone it wants. Rahul Gandhi recalled that the UPA government led by his party had given the contract for 126 aircraft to Hindustan Aeronautics Limited because it had been making aircraft for 70 years. He said that when Modi visited France, the contract was snatched from HAL and given to "his (Modi) friend". "Modi's friend did not make aircraft in his life. That businessman is in Rs 45,000-crore debt," Rahul Gandhi alleged.He said that the contract was given to a company formed only 10 days before the contract.Rahul Gandhi accused the Modi government of snatching jobs from the Indian youth as manufacture of the aircraft by HAL would have provided employment to lakhs of Indians.The Congress leader said that the Non-Performing Assets (NPAs) of banks shot up to Rs 12 lakh crore during NDA rule from Rs 2.5 lakh crore under the UPA rule. He claimed that the entire Indian banking system has jammed.The Congress President targeted Modi for failing to fulfil the commitments made to both Telangana and Andhra Pradesh at the time of the bifurcation of undivided Andhra Pradesh. 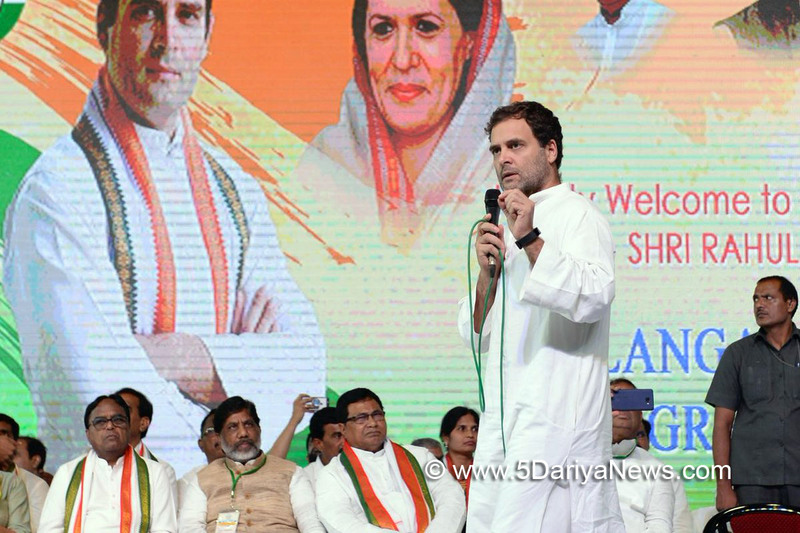 He said that if voted to power, the Congress would fulfil all commitments, including special category status for Andhra Pradesh.Aiming at Telangana Chief Minister K. Chandrasekhar Rao, Rahul wanted to know why he supported Modi on demonetisation, the Goods and Services Tax and other issues when the Prime Minister failed to fulfil commitments given to Telangana.Rahul Gandhi said that Telangana has become the "capital of corruption" as only one family is reaping all the benefits.He said that the Telangana Rashtra Samithi chief was no less than Modi in making false promises.He said that if Modi promised Rs 15 lakh in every bank account and two crore jobs every year, Rao promised a job for every family and double bedroom houses to all the poor in the state.Gandhi said that during the last four years, the TRS government had filled only 10,000 of the one lakh vacancies in government departments and built only 5,000 of the promised 22 lakh houses.